My first apartment was adjacent to an imaginary boundary line I’d come to term “The Cusp”. It was right on the line between quiet and calm, and violent and extreme. Heading South from my front door had you walking carefree and content with the world. Leave North? Well, you’re looking over your shoulder, avoiding eye contact, and just trying to make it to the safety of your car. From the front, the small parking lot was void of activity besides the comings and goings of people living quiet lives. In the back, an alleyway was filled with a parade of characters ranging from “should be committed” to “should be incarcerated” with most acting like they had been either and had recently escaped whatever jail or asylum couldn’t hold their particular type of anti-social. Late one night while studying for an art history final, I heard a loud scuffle outside my door on the common walkway that joined the units to each other. In the light of the next morning I saw the physical results of the sounds I’d heard hours before. Blood splatters on the walls and pools where it had collected were everywhere. Later that day, as I returned from class, the manager informed me what had happened. Apparently, in an escalating argument between two crazies, one loon successfully popped out the eyeball of another using nothing more than a Dixon Ticonderoga. Resourceful. I moved from that location soon after. I knew I had been on the cusp of something awful. 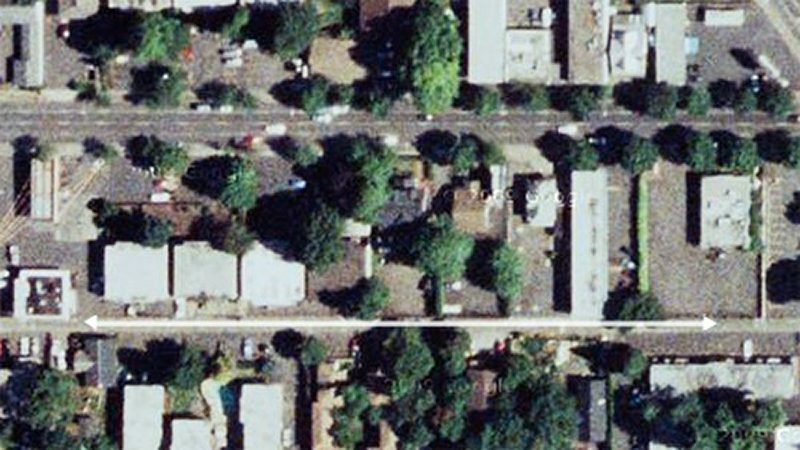 To this day, that mental boundry between decent and disturbing still defines a huge swath of Eugene, Oregon for me despite having fond feelings for the area as a whole. The edge defines the interior. The contrast between the two sides gives identity to the other. When I was 14, I had a revelation. No, not about why we’re here, how the universe works, or whether dark matter exists or not. Nope. This was about color. It was the idea that the color we perceive an object to be is actually exactly the sum colors that it is not. So, a green leaf is not green. A yellow sunflower is anything but yellow. And, a red apple is absolutely not red. I came to realize that viewing the majority of the world via reflective light meant an object was actually just reflecting the color with which we were trained to identify it as being. But, that meant a green leaf was actually everything except green, or more accurately, the color of a leaf is “not green” since the colors it actually possesses, keeps, absorbs, does not release, are all the other colors we place in the visible spectrum that are “not” green. The green is expelled, deflected, and rejected. Reflected. What’s the point? Well, it’s an example of how most often that details and adjectives which we believe to be intrinsic to something, specifically defining of its character, may not be what we casually declare it is. But, instead is more about what it isn’t. It’s where something ceases to be itself which defines what it is. The crowd chants, but instead of the individual pushing away and into the ether with full disclosure, they turn back unable to take the leap into honesty and transparency. It’s a funny contradiction. So often, people call out for fairness and respect on behalf of the artists and creators of content when situations arise where they’ve been dealt with unethically, unprofessionally, or even illegally. They act as if to be a modern day Norma Rae. But, as soon as names are cited, requested, or specifics to an issue are exposed that allows the anonymous audience to fully understand all parties involved in a particular case of claimed wrong doing, a foul is called and the brave individual is chided and derided for telling the truth bravely. The same truth that prior consensus had established was far too rare and should be sought out and championed for the good of the group. They speak strongly, but won’t shut off the loom and stand up on the table. It’s a strange balance of open sharing and honesty against concealment and hypocrisy. One day, a call will sound for artists to band together against spec projects and contests in an effort to try to regain a perceived loss of value for our work… The next? A spec project is championed without a word of criticism. Similarly, hopes for better work relationships between contractor and the contracted are discussed, but mentioned specifics like what facilities or which individuals to avoid are frowned upon when it’s these very details that hold importance. Everybody wants to race up to the line and shout out with full lungs. Yet, when only inches away, we cower and sulk while watering down our concerns and reduce their importance and value to the anonymous audience we are speaking with. What is this line? Is there a name or a way to address it? Or is it as simple as calling it fear or lack of courage? With all this anonymity, you’d think the free exchange of ideas and information would be hard to hold back. But, instead it remains impotent. There, but ineffectual. Amazing how much tiptoeing we all do, when in reality the amount of real help and valuable information we could all share is enormous if only we could get over ourselves and remove these imagined bonds. This could go on and on, but as we’re not too particularly fond of rants ourselves… we’ll leave it at that since this probably doesn’t make much sense anyways. Okay, so of course no case need be made. That just sounded like a good title for this entry instead of ‘Color Loving on Your iPod’. Now, this isn’t meant to be an endorsement for iPods, iPhones, or any Apple handheld, but rather any device that has software allowing for quick mark making and color picking. It’s one thing to talk color with a client or co-worker and clearly something else to actively collaborate with one another while using an interactive application that both parties can simultaneously view, manipulate, and have present with them so long as they have a charged battery. Enter the mobile device sketch app. Brushes, Sketchbook, Layers… It doesn’t really matter which one so long as you have a color picker and a blank canvas to make marks. This color picking ability gives value to possessing this type of software on your mobile device even if you have no intention to draw or paint on the screen. It’s really just a quick and convenient color palette to have on you at all times that lets you show color with color rather than abstractly describe color with words alone. Orange and blue to one person may translate as salmon and turquoise in another person’s mental color palette. Nobody wants confusion on these most basic and important of design decisions and this is just one more way to avoid that. 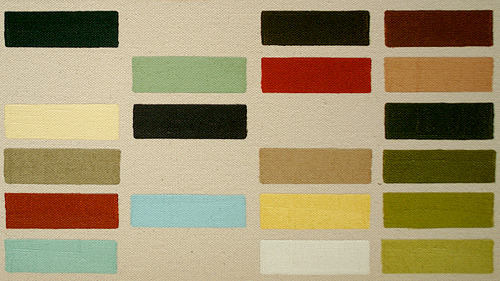 Don’t bother with Pantone chips if you don’t have to. You can always match later. And what’s that you say about the Pantone app? Well, in all honesty it’s fairly useless since the screen on an iPod/iPhone is so inconsistent with it shifting wildly red from one side and blue from the other that number matching may be just downright pointless with the current screens. Ever hear somebody explain their uncertainty or inability to make a critical design decision by stating that they are a ‘visual person’? And, did it end up that they weren’t a visual person at all, since a visual person would be able to actually visualize using their mind’s eye rather than you laboring to provide them with twenty color swatches, endless comps, countless styleframes, and near completed designs? That’s where this mobile color picking idea comes in to provide relief from and to give you a bit more control over preliminary design decisions specifically involving color, but without the hassle of lugging pantone color chips, wasting time sourcing online imagery, or even busting out the ol’ marker bin to find the correct color and value. 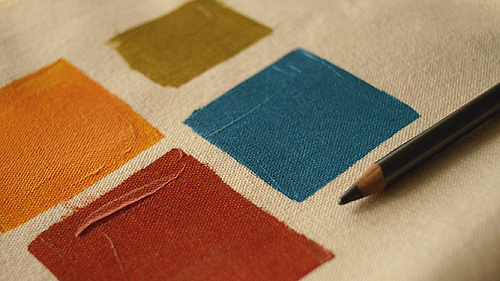 Pick a color under consideration, make a mark, select another color and value, and juxtapose against the previous. Success? No? Try again. Pass it to your client. Let them explain themselves more clearly and directly on the screen, which will in the end help you help them. Too easy and convenient. It’s already in your pocket or bag, right next to your notes during your pre-pro meeting in conference room C. Oh snap, just saved you a day’s worth of reviews right there since your number one client really wanted dull yellows and greens rather than what they had initially told you and outlined on their boards. In the end, it’s just a handy alternate use of something you may already possess, but might not be taking full advantage of. We thought it worth considering. Here’s to color mixing and better color communications! We’ve received a number of emails asking about the small animated sampler we created for our Hello Neighbor EP using apps on the iPod Touch. And so as an exercise in efficient communications, we thought it would be best to quickly answer those questions here. There aren’t really any secrets. As a wise man once said, “There’s nothing to it, but to do it.” As usual, he was right in this case as well. -Frames were animated one by one the old fashioned way. -Drawing and painting all done on the touch screen of an iPod Touch. -Minor texture elements were imported into the frames using the ‘photo’ app. -Layers were used along with the simple transparency slider provided for compositing. -Layers were flattened and reimported due to limitations of the number of layers available. -Frames were output for final Quicktime using AE for finishing and color adjustment since the apps could not do this themselves. -File management was very time consuming and required a bit of trial and error to find the best approach. Clearly, we did not set out to make a demo piece of what is possible using the touch interface of the iPod, but rather just set out to make a short sequence that would pair well with the short samples of audio we intended to showcase. Using neighboring locations sounded logical to us due to the album’s musical inspiration, as did sketching source materials onsite. We did not roto or over-paint location photographs. These are original location illustrations. Combine this all with our fondness for developing new work flows with new tools and this is our result. The device has its limitations and advantages, both technically and creatively, but what and how those affect the user are probably specific to each artist and what they bring to the table. Much time was spent just figuring out the actual file work flow. Anyone familiar with multitrack recording and mixing down tracks to make room for more will understand what has to be done when you’re working with limited layer amounts. Lots of flattening and then reimporting from the photo app to the paint app was necessary. Even just exporting the stills from the paint app to either email or for export using ‘image capture’ in osx required a modest amount of trial and error before figuring out and acclimating to the repetitive steps. Very repetitive steps. Another common inquiry we’ve heard repeated has been, “What do you mean you created it on an iPod?” which has puzzled us a little bit. It was created on an iPod just as an animation cited as being “hand drawn” means that it was drawn by hand. The lines and paint were all created by hand. Textural elements were composited inside the device using layers and a simple ‘transparency’ slider. No secrets. The final frames were then uploaded to a desktop mac so we could assemble the final Quicktime file as we could not find an existing app that would let us collate and marry the audio on the iPod itself. Maybe in the near future on the iPad, but not when this promo was created. Again, obviously this is in no way the limit of what is possible. This project was created to be visually simple to match with the melodically simple snippets of audio. Though, we look forward to further use of the iPod/iPhone/iPad touch interface as a tool if we believe it to be potentially useful in upcoming projects. 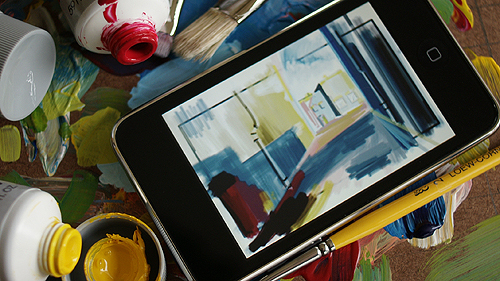 If you have one of these devices, are an artist, and do not currently have a paint app then you are sorely missing out. It really is a ton of fun. We promise! And, if you happen to find yourself at one of the locations rendered in the animation with your own touch-screen-paint-device and whip up a sketch… Send it along as we’d love to see ’em! Forget whether it’s good or bad, high art or low brow, or even if you’ve only seen snippets as you browse the cable dial. Essentially the core of the story and it’s main character Dalton, as performed by Patrick Swayze, have been co-opted by contemporary “reality” television shows and is being used over and over again with a different pseudo-celebrity in slightly varied situations. In this classic scene, we see what makes up most of the cultural cliché and sets up the rest of the material. It has become textbook and here’s how it works… An expert is recruited by an individual who’s business is failing, or at least requires restructuring to survive. Said expert, though initially appearing either too small, too female, or too brash, then observes the business in its normal routine of operation. Usually, this is slightly covert and low pressure or at least presented as such. After witnessing first hand the shortcomings of the staff and the owner, the expert gives their speech and introduction where, with mild emotion, they curtly state how things will change. Or, as Dalton says, “It’s either my way or the highway”. A boring threat, but still a threat nonetheless. As the new plan is put in place, some have difficulties while others excel. Some are verbally destroyed while others well with emotion and are praised. These highs and lows proceed until the expert leaves after having giving those who remain the tools to carrying on. This isn’t necessarily a narrative canon crafted solely by Road House, but it has been an example so culturally absorbed that it stands out as a prime reference. Sure, movies involving military enlisted and drill sergeants hit some of the same notes, but the soldiers go off to battle alone and do not fight along side their teacher as in Road House. And they don’t contain easy to pocket phrases like “right boot” and “pain don’t hurt” which, since their creation, have been passed endlessly between friends when out at a bar. So ingrained like the words and actions of other cult films, often the origin is forgotten and unknowingly reinterpreted in other media without credit or awareness of their prior existence. Unreality “reality” shows have followed and developed a few subgenres of their own. Romance, physical abuse, quasi-dramas, roommates, sleep crime, food assault, face humiliation, etc. Focusing on the shows featuring an expert at their center, they differ only from Road House in that nobody has their windpipe torn out through their neck and, so far, blades have been kept off footwear. These experts put on in such a way that they even further diminish the idea of reality in a “reality” show. Swayze’s Dalton may come off as unbelievable, underdeveloped, or emotionally shallow, but this character of fiction may have more dimension than the people who claim to be real world experts and who allege ignorance of the cameras that capture them. Do we care if a restaurant owner is unbalanced? Do we care that salon X in Anytown, USA has a bad receptionist? Do we care that immature parents can’t manage their own children? Of course not, and we don’t care about a struggling Missouri bar either, but it hasn’t been sold to us as an insight into real people with real lives that aren’t receiving monetary compensation for their appearance. It has been presented honestly, as a made up story full of made up characters. What is surprising is that despite Road House being a work of fiction, its effects on pop culture may be more genuine than the reality we’re offerred by these modern day charlatans pedaling their arrogant brand of expertise and ripping off Dalton all the way to the low budget bank. Or not. Who knows? But, take Dalton’s advice and perhaps we make the world a better place. In the future, you’ll buy everything again. 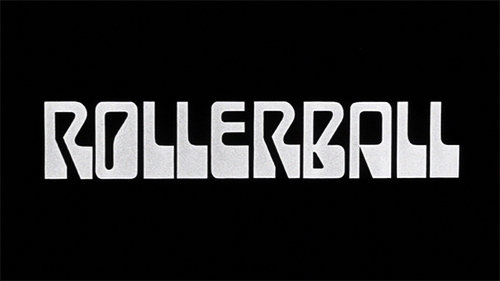 This assumes you know and have seen the 1975 film Rollerball (dir. Norman Jewison). If not, then get to it. Everybody’s waiting. It’s a problem all futurists deal with. How do you predict the future when you live in the present? Surely, written authors are let off much easier than those working in visual mediums like illustration and film as their predictions have much more leeway in the mind’s eye of their audience. Maybe if Nostradamas had to paint a representational picture with shapes and forms rather than drafting vague generalities with words, we’d be less burdened by cheap cable programming and tabloid stories that parade his name and others like him as genius soothsayers to be considered only after an event can be found to match conveniently with their texts. Film is different. You can’t simply describe a future technology, monster, or philosophy with words. No, that’s left to the writers and re-writers. At some point the audience has to see what the future-beast that attacks Neo-Portland looks like or the car-like vehicle that drives sideways like a crab rather that straight ahead like all us present day primitives are accustomed. With special effects, clever photography, and design we are privileged a glimpse forward and in some cases it indeed feels not only possible, but briefly even real. Time passes. The years depicted roll by and frame the futurists’ view differently. Some are shockingly accurate, while others fall short. Rather than imagining brilliant possibilities, the work now stands to show the shortcomings of our predecessors’ imaginations. The older among us remember their original interpretations, while the younger sneer and snicker at the ridiculousness of it all. Specifically, the 1975 film adaptation of the story The Rollerball Murder by William Harrison, released simply as Rollerball, is considered here against the above observations. So easy it would be to dismiss its visual depiction of the near future as inaccurate and more 1970’s than 2018, but instead consider all its perceived faults as minor art directed moments of genius. Skew your point of view just a couple degrees, and look past the dystopian canon of corporations taking over world government while oppressing the individual, and instead focus on what is in the frame. These aren’t antiquated ideas of the future. No, this is a future where the past is embraced with unspoken irony and can all be purchased at minor cost in a future Urban Outfitters, which could easily be one of the competing corporations that rival Energy Corp.
Rollerball is not just a film set in the future with futuristic details, but rather a film set in the future with a western culture that has a penchant for a retro-future vintage lifestyle. The brilliance of this though, is that it could only be noticed and appreciated over thirty years from its creation. Truly, a future destiny fulfilled. The font used for the film’s titles, jersey numbers, and scoreboard insets is so obviously future-retro that to dismiss it is to misunderstand it. Even today, contemporary sports teams wheel out the vintage jerseys from time to time as a nod to the past and a nod to increased merchandise sales. In the film’s timeline, the use of a font like Countdown (1965, Colin Brignall) would have to be intentionally ironic and self-aware, since it was already ten years old by the time the film was completed and will be 53 years old by 2018. The automatic overuse of typefaces like Helvetica and Gill Sans to indicate minimalist precision would have become so tiresome in the 2000’s that designers would surely be reintroducing styles once thought ‘lesser than’ and trivial in their own day. Hence, a typeface like Countdown becomes not only appropriate, but possibly even ‘correct’. In any case, we’re waiting for our film-accurate long sleeve shirts to arrive if anyone out there is producing samples. Number six and number nine, please. A velodrome? Oh, how very rollerderby. How very 70’s. But, look closer and the track has been adjusted from an oval to a circle to help break from past sports. Look at how the square boxing ring has been co-opted by wrestling leagues and then its sides multiplied by two, thus forming the octagon of current blood sports. In light of this modern precedent, this redesign seems rather prophetic. Those combustion engine motorcycles? Even in the 1970’s, an energy economy based on oil and refinement was beginning to find mainstream scrutiny. Perhaps this is also a bit of nostalgia from the future where technological advances like electric motors have come into their own, but tradition overrides their acceptance like wooden bats in baseball or ice surfaces in hockey where modern synthetics and technological advances could provide more accurate consistency and more environmentally friendly manufacture. Even the violence depicted is strikingly similar to modern blood sports. At least two players are shown being intentionally concussed towards death and brain damage by the other team. And presently, what could be more directly brain damaging than obstructing a person’s airway as with raw strangulation and the championed submission holds witnessed on countless modern cable television channels where modern gladiators compete? In Jonathan’s modern home, we observe him using a then vintage 4:3 television where he watches replays and home movies shot in film. How many lo-fi film cameras are still being offered up by resellers of pop culture accessories? How many people still hoard discontinued super8 film stock? Cameras like the digital Exemode sq28m or the updated Holgas and Diana toys are still sought by many who are happy to moderately overpay for the privilege with companies happy to oblige. Like modern audiophiles who live for silk belted, glass plattered turntables, so to will the day come that aficionados will proudly claim the superiority of a 4:3 ratio and composite signals, happily wallowing in the aesthetic of such items and the memories they can conjure. Some may argue that there is still little evidence of the film’s own self awareness and that these are all simply dated interpretations of the future. To that, one only need to look to a scene where players and their corporate concubines convene in an open meadow during a party thrown in their honor. In high spirits, they begin firing a weapon that looks like a common handgun, but in a single shot can destroy a mature conifer tree. Happily, they do this several times. Evidently, shooting firearms is still an enjoyable pastime eight years from now. If this level of weaponry is available to a common person in a society under such top-down control, then it must be a culture that has advanced far beyond that which is shown during a Rollerball match. From this, one can gather that a population that can develop and casually use sophisticated technology like this has no reason not to be as culturally sophisticated as well. The warm, techno-vintage vibe of the mid 1970’s specific brand of futurism may be a hot ticket after endless exhaustion of 50’s, 60’s, 80’s, and 90’s style. The 90’s will have their secondary rebirth a bit later. Save your eMates, you’ll need them to remain relevant. Sure, there’s the actual core story to the film about the individual versus the state, but all that goes without saying and with watching the picture in its entirety. That said and you still don’t buy Rollerball as an underestimated oracle of man’s future with regard to style, pop culture, and cyclical styles? You will when your local screenprinter is cranking out orange shirts with stylized numerals on the front and reverse, selling out of number ‘6’. And, when in Japan, make sure to look for the yellow version. The circle will be complete and you’ll be there just in time to take a half-frame photo of it all for proof.